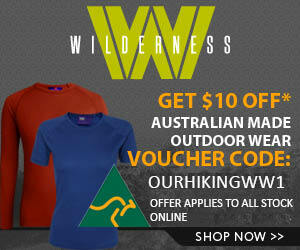 What is the best hiking gear for a wilderness adventure? What gear do I need for a multi-day hike? What is the best equipment (stove, coat, poncho, overpants, sleeping mat) for several days hiking? These gear notes have been included against the advice of my wife who believes it just indicates a tendency towards nerdishness about equipment, extremely embarrassing materialism and makes me look like an overgrown boy scout. So if you aren’t into gear choices stop reading now and if you are, don’t let your partner read it. Their chortles and guffaws are likely to be quite off putting! I admit to being a bit of a gear freak and I enjoy the preparation for walks because it means a planning phase which holds its own pleasures and which provides an opportunity to think anew about what I like and what I need. This year for the South Coast Track I planned to take food for fourteen days and at just under a kilo of food per day that meant a fair proportion of my pack weight would be of food. As a result I planned to pare the rest of my gear down as much as I could. 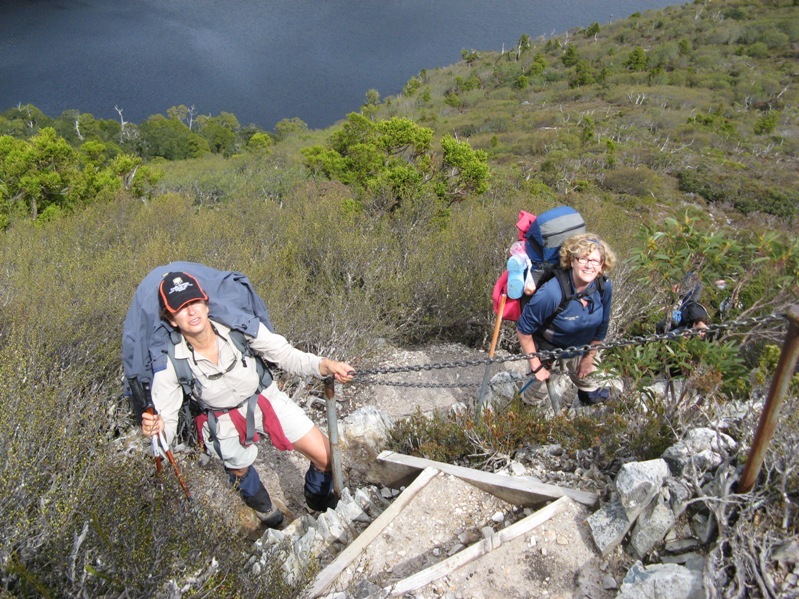 From my experiences on the Port Davey Track last year in some appalling weather I ditched my goretex jacket and pants and a pair of goretex overmits. 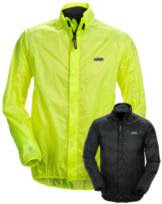 I replaced the jacket with a Montane Featherlite H2O jacket with substantially less bulk and weight. I used this jacket and liked it but the DRW properties were quickly eroded in areas where my pack rubbed on the jacket such as over my shoulders where the straps rubbed and across my shoulders and across the small of my back. Because I predominantly had the jacket as a windproof barrier I wasn’t too worried but I’ll experiment in proofing the jacket again with a slightly different DRW treatment. I believe that you inevitably end up getting pretty wet anyway from the bush, from wading through creeks and from wicking up sleeves, and down through neck openings so I expect to get wet on walks and am not concerned primarily about the level of waterproofness. So the only goretex items I took on this trip were my gaiters. I replaced my goretex overpants with some Golite Whim pants again with a substantial reduction in both weight and bulk. 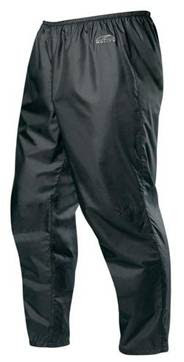 I didn’t end up using the overpants which I took mainly as a windproof barrier for my legs rather than for their waterproofness but if the weather had been like it was last year they would have had substantial use. I live in regional Western Australia and don’t have an opportunity to see and try out exotic gear so I ordered a large pair over the phone and they were enormous on me so my sartorial elegance was really suspect with them on but with the advantage that I could get them on over my boots. I will probably purchase a smaller pair before my next walk. Despite the fact that they stayed in my pack for the trip I’d take them with me again. I gave up on overmits and simply carried two sets of gloves; a fairly light pair of windstopper gloves to walk with and an pair of fleece gloves to use with a fleece beanie and my set of dry gear in camp. It turned out not to be sufficiently cold enough to wear either pair and so these remained unused but I was pleased to carry them. I took a pair of thermals for everyday use and used them only in camp. My recorded temperatures inside the tent on waking (at around 5.30am most mornings) varied from a brisk 4 degrees Celsius to a balmy 13 degrees Celsius. On a whim I took also a tarp/poncho as I’d read positive reports about the use of these. I actually tried to use this as a poncho on the beach trek to New River and it took me half an hour of dancing around in drizzle along the beach trying to put it on. Stupidly I’d only tried this out at home with my wife to help me get it on. I defy anyone on their own to successfully and quickly get into a poncho with a full pack in a reasonable breeze. I must have looked a sight trying various ways to get it over my full (and fairly high) pack in a balanced way. I tried to put it over my head and then manouver it over my pack, fighting the wind’s efforts to blow it back. I used one of my walking poles to try to get it in place and only managed to look stupid. I put it over my pack and then tried to get under everything, and put my pack on with the poncho already in place but only succeeded in getting tangled up. I eventually got it mostly sorted out albeit getting pretty wet in the process and it worked for the next couple of kilometres until I got to the boat crossing where I needed to take it off anyway. I think that ponchos are only useful when walking with another person who can assist in arranging the poncho across the pack so that it drapes as intended. On the one day that I holed up from some heavy rain I used the poncho as an additional tarp which gave me some added scope for movement outside of my tent in the rain but I wouldn’t take it again. If I wanted additional tarp space (a luxury), I’d take a spinnaker tarp instead. So the poncho will be consigned to the growing pile of gear that I’ve tried and discarded. I ditched my self inflating mat (three quarter length) for a Thermarest Z Lite closed cell foam mat for a substantial savings in weight but an increase in bulk. My experimentation with this before starting the walk had revealed that my hips (I’m a side sleeper) compressed the foam enough to mean the insulation was insufficient and I got cold. I always previously carried a small piece of closed cell foam as a seat in camp and as a foot pad for my three quarter length self inflating mat and I found that this was usefully employed under the Z lite in my hip region to provide the necessary insulation. I disliked the added bulk of the Z lite inside my pack and found the lack of comfort when sleeping a frustration. Sleeping mats are always a compromise but I’ve resolved to shell out for an Exped Downmat for winter trips in the future. I’ll endure the additional weight in return for greater insulation and comfort. 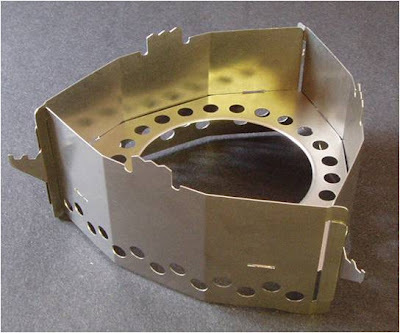 I opted to change my stove system from my Triad titanium burner used last year and go for more convenience but extra weight by purchasing a Clickstand and using a standard Trangia burner. I went for the heavier Trangia burner for two reasons. 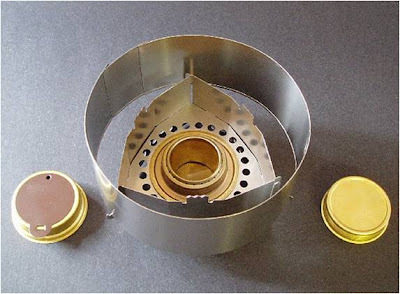 Firstly it enabled me to carry unused fuel in the burner as the cap has an o-ring. The second reason is because it has a simmer ring. I’m not sure why I think that this is an advantage because I never simmer and didn’t on this trip but it came with me and was used only as a snuffer for the burner. I like the Clickstand but was careful about packing it because I didn’t want to bend the frame and render it useless. So I had to take a bit more care with packing than I’m used to. I normally get pretty violent in ramming gear into small spaces in my pack, particularly at the beginning of a trip when space is at a premium. My MSR titanium pot came again with its home made pot cosy. I also took my favourite double-wall titanium mug rather than a lighter single wall one I sometimes use. Some luxury is worth it. I took 1600ml of metho for my stove in a 1 litre MSR fuel bottle and a 600ml coke bottle. I always get too nervous about fuel use and ended up using just on a litre for the eleven days. This year I took a small pair of binoculars which I thought would be useful and provide me with another dimension of interest along the coast. I ended up using these very little and mostly only because they were there and because I didn’t want to take them back unused. I wouldn’t bother with the weight again on a walk. I have a thing about leeches and some interesting experiences with them. During the year I engaged in some research and wanted to experiment on this trip with Pyrethrin (or Permethrin its synthetic equivalent) as it was reported to be very effective against leeches. I’d considered DEET but had rejected that as being noxious to me and not as effective as Pyrethrin. As I normally do I took salt but this time before starting I rinsed my walking pants, socks and gaiters in Permethrin shampoo intended for pets. I also took some Pyrethrin horse insecticide in a small spray bottle. I doubt that the shampoo wash made much of a difference as the constant soaking of my clothes would probably have rendered the wash useless after a short time. This trip I didn’t have much of a problem with leeches but the few I had a chance of having a go at shrivelled up with a touch of the Pyrethrin spray and unlike DEET, Pyrethrin doesn’t affect fabric or plastics. So I’d take that again and leave the salt behind. Salt is always a problem because of its need for waterproof storage. Many thanks to Larry for his excellent write up and review of his gear. We will post part two in the next few days where the rest of this self confessed “gear junkies” equipment for the trip is reviewed. I owned a bag called the maxpedition fatboy versipack. I can fit all my gear into such a small carry pouch. Thought you would want to know about it. It would do great in Tasmania!